BOSTON, MA -- (MARKET WIRE) -- July 7, 2005 -- On July 27 at 4:30 p.m. 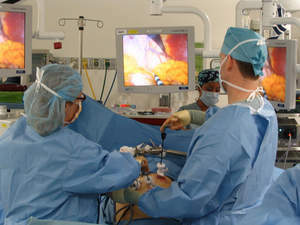 ET, surgeons at Brigham and Women's Hospital (BWH) in Boston will broadcast a live laparoscopic adjustable banding (LAP-BAND®) procedure for the treatment of morbid obesity on www.OR-Live.com. The webcast, tenth in a series, is intended to educate physicians and patients about the latest minimally invasive surgical techniques now available for weight loss. Laparoscopic adjustable gastric banding is a new minimally invasive surgical treatment for weight loss that requires no stomach stapling or intestinal re-routing. The LAP-BAND® is adjusted in the physician's office for the needs of each patient. This procedure enables patients to recover more quickly with less pain and less risk of wound complications than traditional weight loss surgery. Ashley H. Vernon, MD, Associate Surgeon at BWH, will perform the procedure, assisted by David B. Lautz, MD, Director of Bariatric Surgery. Malcolm K. Robinson, MD, Director of the BWH Program for Weight Management, will narrate the webcast, which will include an overview of pre- and post-surgical considerations, patient candidacy, and risks and benefits of laparoscopic adjustable banding. "Our team is dedicated to caring for patients with obesity using the most advanced approaches to treatment integrated with programs for patient education and support," said Dr. Vernon. Laparoscopic adjustable banding is one of many new options available at the BWH Program for Weight Management, which offers a comprehensive range of personalized nutritional, medical, and surgical weight loss and weight maintenance approaches. BWH is a 735-bed nonprofit teaching affiliate of Harvard Medical School and a founding member of Partners HealthCare System, an integrated health care delivery network. Internationally recognized as a leading academic health care institution, BWH is committed to excellence in patient care, medical research, and the training and education of health care professionals. The hospital's preeminence in all aspects of clinical care is coupled with its strength in medical research. A leading recipient of research grants from the National Institutes of Health, BWH conducts internationally acclaimed clinical, basic and epidemiological studies. Visit http://www.or-live.com/BrighamandWomens/1372 now to learn more and view a program preview. A VNR is available at http://www.or-live.com/rams/brw-1372-mkw-q.ram. LAP-BAND® is a registered trademark of Inamed Corporation (NASDAQ: IMDC).